The all-star show was held to remember the victims of the suicide bombing at an Ariana Grande concert on 22 May. She told the crowd: "I want to thank you for coming together and being so loving and strong and unified." She added: "I love you guys so much, and I think that the kind of love and unity that you're displaying is the medicine that the world really needs right now." Visibly moved at times, the 23-year-old US singer performed with Miley Cyrus and the Black Eyed Peas, while other highlights were provided by Katy Perry, Coldplay, Robbie Williams, Liam Gallagher and Justin Bieber. The concert at Old Trafford cricket ground was watched by an average of 10.9 million viewers, peaking at 14.5 million as the gig drew to a close. Ciara Lynch, 15, from Wigan, was at the Manchester Arena show that was attacked, but said she "didn't think about it really" during Sunday's concert. She said the One Love Manchester concert was "amazing", adding: "It was emotional at the same time. "When she sang One Last Time, I cried then. But everyone was so close, even if they didn't know each other. It was really good." Her friend Lauren Bromelow, also 15, said it felt like everybody at the show had "come together as a family". Sarah Stones, 25, from Salford, Greater Manchester, came "very, very close to cancelling" - but said she was reassured by the heavy police presence. Describing the mood of the night, she said: "This was all happiness. You're all as one. You're one team. "Every single time an emotional song came on, it really hit us. I have no words for Manchester tonight." Her friend Jamal Iddi, 23, from Tameside, said the attack on 22 May "hit everyone in the city". He said: "Anyone who lives in Manchester feels the pain. And this was a very, very good way to remember and keep on remembering the people who have passed away." It wasn't just the fans who got into the spirit of the show. Police officers danced, medics sang along and one lively steward encouraged the crowd to clap and dance. Grande made appearances throughout the show. She sang My Everything with students from Parr's Wood High school in Manchester, comforting 12-year-old soloist Natasha Seth when she was overcome with emotion. She also told the crowd how she changed the set list at the last minute after meeting the mother of Olivia Campbell-Hardy, 15, who was among the 22 people who died in the attack. Grande said: "She told me Olivia would have wanted to hear the hits. We had a totally different show planned and we had a rehearsal yesterday and we changed everything." She also performed Oasis' Don't Look Back In Anger with Coldplay's Chris Martin before Martin accompanied former Oasis singer Liam Gallagher on Live Forever. Speaking in his home city, Gallagher dedicated the song to "the beautiful people who were killed and injured" in the attack. At the end of the show, Grande was joined on stage by the night's other stars to perform the song One Last Time before finishing with a poignant solo rendition of Over the Rainbow. 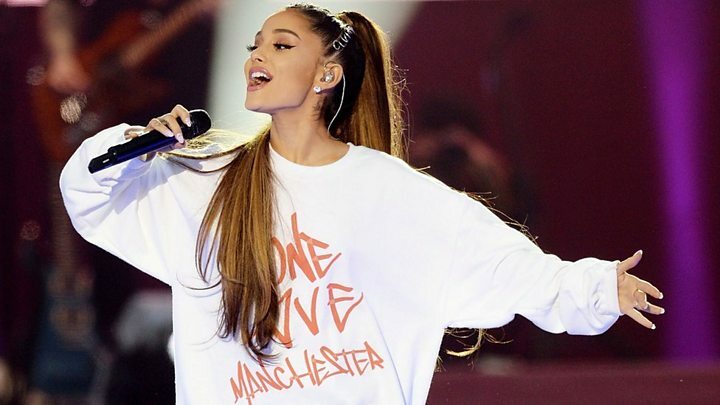 Grande wore a One Love Manchester sweatshirt - and many of the fans wore shirts bearing similar messages, or face paint saying "I heart MCR", or #WeStandTogether stickers. Organisers said the night had raised £2m for victims and families through text and online donations, taking the We Love Manchester Emergency Fund's total to more than £10m. On Saturday, Grande announced she is re-releasing her song One Last Time, with proceeds going towards the campaign.